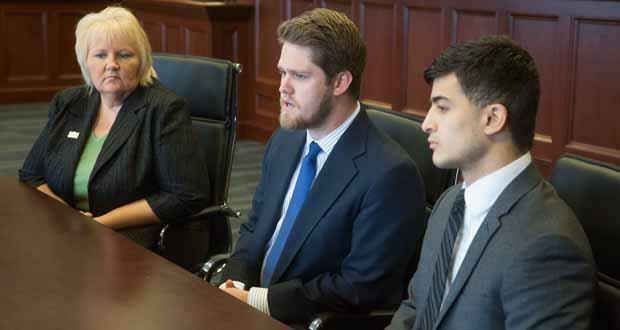 Oklahoma City University law students Sonya Chronister, Cameron Farnsworth and Marcos Sierra talk about the Oklahoma Innocence Project’s latest work while sitting in the J. William Conger Courtroom at the OCU School of Law. The Journal Record’s Molly Fleming writes more potential clients are now reaching out to the Oklahoma Innocence Project after that first success, according to executive director Vicki Behenna. The mail pile dates back nearly two years. About 80 percent comes from prisons, nationwide. During his weekly conversation about business news in Oklahoma, Journal Record editor Ted Streuli told KGOU that the types of cases the Oklahoma Innocence Project pursues are very expensive. The law clinic’s one full-time employee is a legal assistant. Streuli says the project is funded by donations. “They’re really hoping that one of theses days they’ll find a benefactor who might provide an endowment to secure their future,” Streuli says. Jacob McCleland: Ted, Journal Record reporter Molly Fleming wrote a piece this week about the Oklahoma Innocence Project. Why is their caseload booming right now? Ted Streuli: Well, the Innocence Project has had success now exonerating two men, Malcolm Scott and De’Marchoe Carpenter. And that success, which got a lot of attention, has attracted a lot of others who hope the Innocence Project will be able to take their cases as well. McCleland: Could you refresh us a little bit on those two exonerees, Scott and Carpenter? What’s their story? Streuli: Sure. Well, Scott and Carpenter, who were both 39 years old last year when they were let out of prison, were each sentenced in Tulsa County to life plus 170 years after being convicted of the first-degree murder and some related charges in a 1994 shooting in which 19-year-old Karen Summers were killed. They were exonerated a year ago and freed from prison after an Innocence Project investigation uncovered some new witnesses and some new testimony that the jury did not hear at the time. McCleland: So what cases is the Innocence Project taking up right now? Streuli: Well right now they have two cases that are already in the courts: Willard O’Neal’s in Tulsa County and Patrick Sampson in Pawnee County. A Pawnee County judge asked the Innocence Project to look into Sampson’s case after he saw the group’s success with Carpenter and De’Marchoe. McCleland: What’s are the stories behind these two individuals? Behind O’Neal and Sampson? Sampson was convicted of first-degree murder and first-degree arson charges. That was in 1995 in the Pawnee County death of a 20-year-old man who burned to death when the trailer in which he was sleeping was set on fire. But clearly a judge there isn’t comfortable with that conviction. McCleland: How does the Innocence Project find these new cases? Streuli: In the case of the Pawnee County situation, that judge asked the Innocence Project to look into it after he saw the group’s success elsewhere. McCleland: Do they receive requests directly from inmates, for instance? Streuli: They get a lot of requests from inmates. They've now got someone, a law students, whose full time job is sorting and opening the mail. About 80 percent of those requests that they get by mail come prisons around the United States. McCleland: I imagine these cases are very expensive. How does the project find lawyers to work on them? Streuli: Jacob, you’re right. They are expensive. They typically cost $40,000 to $50,00 per case, but in some cases, the costs can be double that. Since the clinic’s success has raised it’s profile, that’s in turn drawn more attorneys who want to volunteer to help, but they still have a huge backlog. McCleland: How many full-time employees does the Oklahoma Innocence Project actually have? Streuli: Well they have one, and she’s a legal assistant. The rest of the staff are law students and volunteer lawyers. McCleland: And they are law students at Oklahoma City University’s law school. McCleland: So what do the students and attorneys who work on these cases say about criticisms that their work is kind of like a witch hunt to find who erred in an investigation? Streuli: They deny that completely. They remind their critics that their work is solely about getting someone out of prison who shouldn’t be there. They’re not interested in laying blame to someone in the past. McCleland: Where does the Innocence Project’s funding come from? Streuli: They compete with other non-profits for donations, but they’re really hoping that one of theses days they’ll find a benefactor who might provide an endowment to secure their future.